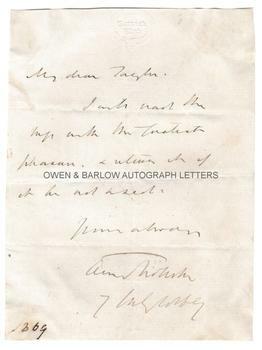 ANTHONY TROLLOPE autograph Letter Signed. British (English) novelist. Author of 'Barchester Towers', etc. ALS. 1p. The Garrick Club. 7th July 1869. 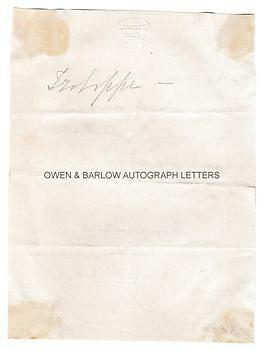 To "My dear Taylor" (almost certainly Sir Charles Taylor, one of Trollope's closest friends). "I will read the [MS ?] with the greatest pleasure and return it if it is not used. Yours always, Anthony Trollope." 8vo. Approx 5.75 x 4.25 inches (15 x 11 cms). Old folds and creases. Trimmed at edges (not affecting text or the impressed letterhead of the Garrick Club). Mounting traces to corners of verso. All else in very good condition. Anthony Trollope said of Taylor that 'among the friends of my later life there was no one whom I more thoroughly loved'. He described him as King of the Garrick Club and the best giver of dinners. When an officer of Horse Guards (who Anthony Trollope particularly disliked) drove his friend from the Garrick, Trollope threatened to join the Athenaeum instead. Provenance: From the 19th century album compiled by the family of Dr James Copland FRS (1791-1870), the Scottish physician and eminent writer on medicine.